We all know very well that there is no doubt that we are at the gates of an era of great discoveries about the human brain and its activity that still has many secrets. There are those who want to connect the brain to a computer, there are those who want to connect our brain mass to the Internet, and there are those who are deeply committed to perceiving the complex human organ. However, now according to the latest reports, scientists have recently, turned on the world’s first human brain-like supercomputer. There is no doubt that we are at the gates of an era of great discoveries about the human brain and its activity that still has many secrets. There are those who want to connect the brain to a computer, there are those who want to connect our brain mass to the Internet, and there are those who are deeply committed to perceiving the complex human organ. The largest neuromorphic supercomputer in the world was connected. A machine designed and built to work just the way a brain works. A computer that has a million processor cores. The brain is the most complex organ in the body and the most difficult to unravel. Scientists have developed a variety of methods to better understand the brain, including the use of supercomputers. The largest neuromorphic computer in the world, called SpiNNaker (Neural Network Architecture) or “neural network architecture by voltage peaks”, referring to the electrical “firing” of the synapses, which communicate between neurons, was connected recently for the first time. The supercomputer will be able to complete more than 200 million actions per second thanks to its set of one million processor cores, each of which has 100 million components. This superstructure is capable of executing 200 billion shares per second. SpiNNaker is 20 years old and close to $19.5 million in production cost. The project was originally supported by the Research Council of Engineering and Physical Sciences (EPSRC) but was most recently funded by the European Human Brain Project. The supercomputer was designed and built by the University of Manchester Computer Science School. Construction began in 2006 and the supercomputer was finally connected yesterday. 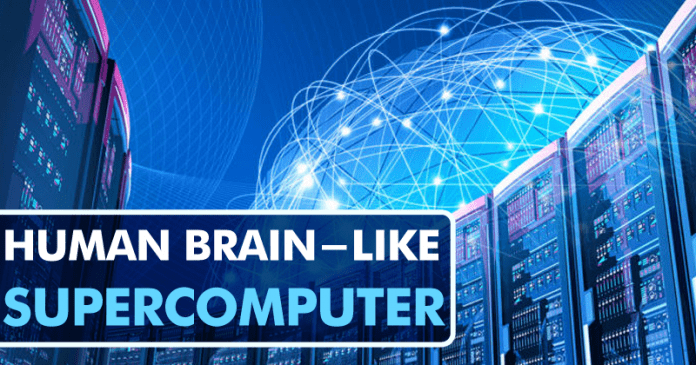 SpiNNaker is not the first supercomputer to incorporate one million processor cores, but it is still incredibly unique because it is designed to mimic the human brain. Most computers send information from one point to another using a standard network. SpiNNaker sends small bits of information to thousands of points, similar to the way neurons pass chemicals and electrical signals through the brain. This supercomputer uses electronic circuits to mimic neurons. “SpiNNaker completely rethinks how conventional computers work. Basically, we created a machine that works more like a brain than a traditional computer, which is extremely stimulating,” a professor of computer engineering, Steve Furber observed. The team behind SpiNNaker hopes the machine will help them “unravel some of the secrets of how the human brain works by running unprecedented large-scale simulations.” The Spinnaker has so far been used to mimic the processing of more isolated brain networks, such as the cortex. It was also used to control SpOmnibot, a robot that processes visual information and navigates towards its targets. Those responsible for SpiNNaker plan to create a supercomputer that emulates one billion biological neurons. The human brain contains about 100 billion neurons connected through 1 billion synapses. The SpiNNaker brings us one step closer to a better understanding of the human brain. Supercomputers were first introduced in the 1960s but have become increasingly popular and powerful in the last decade. The Oak Ridge National Laboratory (ORNL) supercomputer of the United States Department of Energy recently received the distinction of being the fastest supercomputer in the world. This work of computational engineering prides itself on a LINPACK benchmark score of 122.3 PFLOPS. The US Department of Energy plans to use the Summit for energy research, advanced materials, artificial intelligence and learn more about diseases such as cancer and Alzheimer’s. So, what do you think about this? Simply share all your views and thoughts in the comment section below.